With Apple focusing heavily on augmented reality in iOS 11 through ARKit, Apple CEO Tim Cook received several questions about AR during today's fourth quarter earnings call. He was, of course, questioned about augmented reality hardware, a question he dodged by explaining that Apple's all about the experience. In terms of monetization of AR/VR, we focus first and foremost on customer experience. We're all about making sure the customer experience is great. We think if we get the experience right, revenue and profits will follow. We're very much focused on the experience right now. On augmented reality in general, Cook said there are "fantastic" people at Apple who are working on incredible things, and that Apple is in a "unique position" to lead when it comes to augmented reality. I view AR as profound. Not today, not the app you'll see on the App Store today, but what it will be, what it can be, I think it's profound, and I think Apple is in a really unique position to lead in this area. Augmented reality "amplifies human performance instead of isolating humans," Cook explained. "It's a help for humanity, not an isolation kind of thing for humanity." He said the "very cool thing" about augmented reality apps is that they're "all over the place." There are more than 1,000 ARKit apps in the App Store now, across a wide range of categories like shopping, gaming, entertainment, and business. "I see apps that make me want to go to K-12 again and repeat my schooling because it changes the game in the classroom," said Cook. 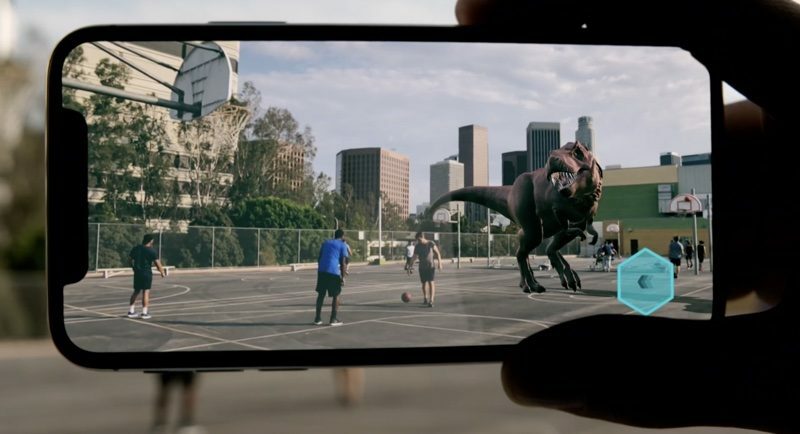 "The real beauty is that [AR] is mainstream and, of course, Apple is the only company that could have brought this because it requires hardware/software integration." He went on to compare ARKit to the launch of the App Store in 2008 and its subsequent growth. This is very much like in 2008 when we fired the gun in the App Store. That's what it feels like to me and I think it will just get bigger from here. Though Cook focused heavily on software and Apple's existing augmented reality experiences during the call, rumors have suggested that Apple is exploring augmented reality hardware solutions that go beyond the iPhone, like a set of augmented reality smart glasses. Work on the smart glasses is said to be in the early stages, with many technical hurdles still to overcome, so a launch is not expected for quite some time. The entirety of Apple's conference call is now available from Apple's website. AR is such a gimmick. Yeah. just like virtual keyboards were gimmicks back in 2007. Just like Bitcoin in 2011 was just internet play money. Just like impossible odds of the golden state warriors blowing a 3-1 lead. Just like there was no way Trump would win the 2016 Election. Just like the Apple Watch was just a fad. Just like Touch ID was such a gimmick. Point is, to you it might be gimmicky, irrelevant, useless, will never catch on, doesn't Stand a chance today, but tomorrow it will be integrated in your world. i already deleted a lot of AR games from my phone just like i deleted most of my apple watch apps. I’m honestly thankful that people with such a short-sighted mentality and lack of imagination aren’t running Apple. Had Apple catered to the whims of the MR crowd since 2001 then we’d be brandishing 3-inch thick PowerBooks still running OS 9. AR just feels like a gimmick right now, hopefully that changes. Maybe as we start to see more practical uses of it rather than just underwhelming mobile games. Can’t wait to see what they’ve got up their sleeve. highlights the products with ingredients I do want to eat. The only thing I see there is a notch in the picture. I just want wearable hardware to catch up. Hololens is a joke. We need a powerful device with a large field of view. I hope Apple engineers are hard at work on that.